968 exhibitors from 12 countries & regions will take part in next week’s Intertextile Pavilion Shenzhen, a 34% increase compared to 2017. Four additional countries – India, Indonesia, Thailand and Turkey – are represented this year compared to the last. 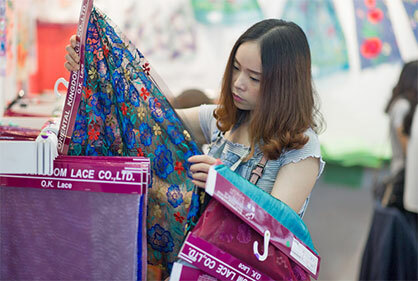 Running from 5 – 7 July, the fair is Southern China’s leading event for apparel fabrics and accessories, attracting big-name Chinese and global fashion brands. Occupying one more hall this year, bringing the total to 37,500 sqm, the fair expands in scale by 25%. Traditionally having a strong focus on ladieswear, the fair has grown rapidly in recent years to include not only a wide range of premium ladieswear, lingerie & swimwear and printed fabrics & accessories, but also casualwear, functional wear, sportswear and suiting for both ladieswear and menswear. Highlights of the fair include the country / region areas – Fine Japan Zone, Korea Pavilion and Taiwan Pavilion – while three domestic pavilions also feature: the Shengze Pavilion, China Bast and Leaf Fibres Textile Association Pavilion and Shaoxing Pavilion. Hefei Qian Knitting Technology: this exhibitor utilises eco-friendly dyes in their fabrics which are extracted from plants including indigowoad root (a traditional Chinese medicine herb), madder and myrobalan. Nantong DongYi Fiber: they will showcase their graphene composite fabric at the fair with all the benefits this technology brings including reduced static, increased blood circulation, strong light absorbance and heat storage and more. Haining SanLi Fabric: the main products they will showcase are new polyamide and spandex fabrics. With the nearly 250 more exhibitors present this edition, regular buyers to the fair will discover new sourcing options down every aisle. Two of the debut participants in the Japan Pavilion include Crystal Cloth and Mona Knit, with their cotton, silk & original print textiles, and jacquard knit fabrics, respectively. Sahsa Tekstil from Turkey will be displaying their haute couture fabrics, mainly from jacquard but also silk and cotton, while Gistex Textile from Indonesia will showcase their 100% woven polyester fabric, and Sino Thai Group from Thailand their range of cotton. New participants from India, including Adinath Dyeing and Finishing Mills (cotton, man-made & functional fabrics), and Innocence Couture & Saiva (Ind) Exim (lace, ribbon & embroidery) will also be present, while nine new participants from Hong Kong, predominantly accessories suppliers, will also take part. Buyers can discover the latest trends at the fair, not just through exhibitors’ products, but also in the S/S 19 trend forum. This features four themes to explain the trend stories: Genesis, Imaginist, Anthropogene and Light Civilization. A number of seminars will also take place, including an in-depth explanation of these trends by the China Textile Information Center, and looking further ahead, the A/W 19-20 ladieswear fabric trends by the Trend Department of POP Global Trend Information, Garments & Home Textile. Italian fabric trend forecaster Creative Placements Asia will also present the key Italian fabric trend stories for A/W 19-20.